TESL Niagara is a non-profit organization with a three-fold mission. TESL Niagara works to provide professional development to Teachers of ESL in the Niagara Region at the elementary, secondary, adult and post-secondary levels. As an affiliate of TESL Ontario, TESL Niagara works to make the occupation of teaching ESL, a better-understood and more respected profession. As an organization based in Niagara, this affiliate seeks to address issues that are of concern to teachers and organizations that service Immigrants and Visiting Students in this unique area. 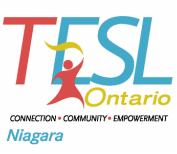 Registration is now open for the TESL Niagara Winter Conference!